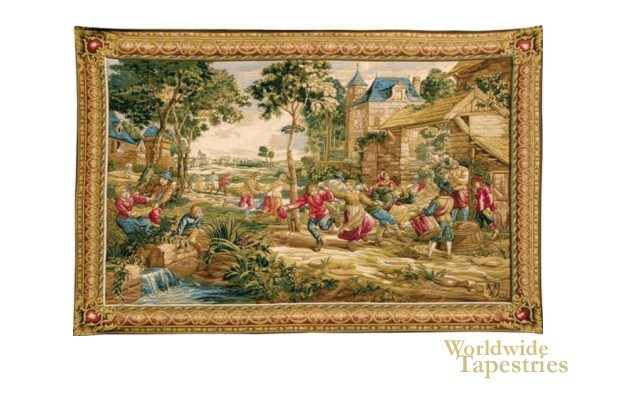 L'Arbre De Mai French tapestry is based on an original cartoon by David Teniers II (1610-1690). The original was woven in 1650 in Brussels by Jerome le Clerc and Jacques Van der Borcht in the Van der Hecke’s workshops. L'Arbre De Mai translates to the May Tree. Here we see villagers playing in the countryside next to their villas. It is a verdure scene of forest and a river and is an example of 17th century art which celebrated life in the countryside in all its simplicity and glory. There is a flurry of activity in this scene as the villagers are running and dancing happily in this countryside scene. This L'Arbre De Mai tapestry is backed with a lining and a tunnel for easy hanging. Note: tapestry rods and tassels, where pictured, are not included in the price.